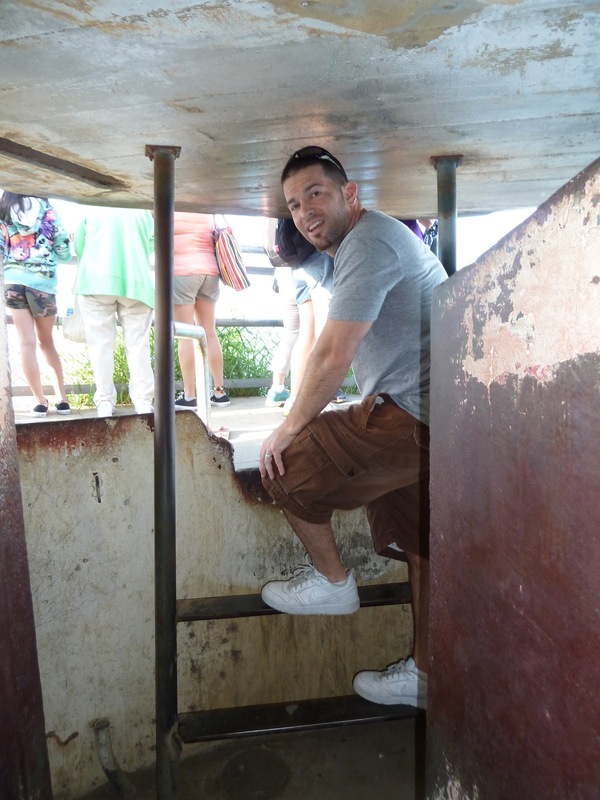 Today we were doing our own island tour. 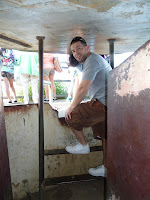 I had researched all the places that were a must visit, found their location and then created my own "Circle Island Tour" and if you ask me, mine was way better than any of the tour bus tours. Not to mention it was just us going at our own pace. I had planed this tour to be our first morning so that we could take advantage of our jet lag. 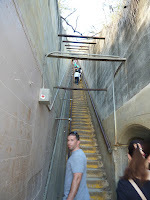 Our first stop was to hike Diamond Head Crater, an old volcano. It's best to get there as early as possible, they open at 6am, to beat the crowds and more importantly, the heat! We left the resort at about 5:50am. Our GPS still wasn't working, however as we were walking out the door I figured out why. For whatever reason, it never finished downloading the Hawaii map! It was too late to fix it, i'd have to do that tonight, so we relied on our Franko Map & I did have the GyPSy GPS Tour Guide App. Matt had looked over the map and came up with his own idea of how we should go, but I was apprehensive because it involved small, neighborhood roads and I remember from my last visit how crazy some of the roads could be. We figured we'd just head in that direction and let Larry (that's what we named the tour guide App) take over. Now, that tour guide app doesn't give you directions per say. It's GPS activated so it will kick in at certain moments and say, "If you look on the right you will see Diamond Head." 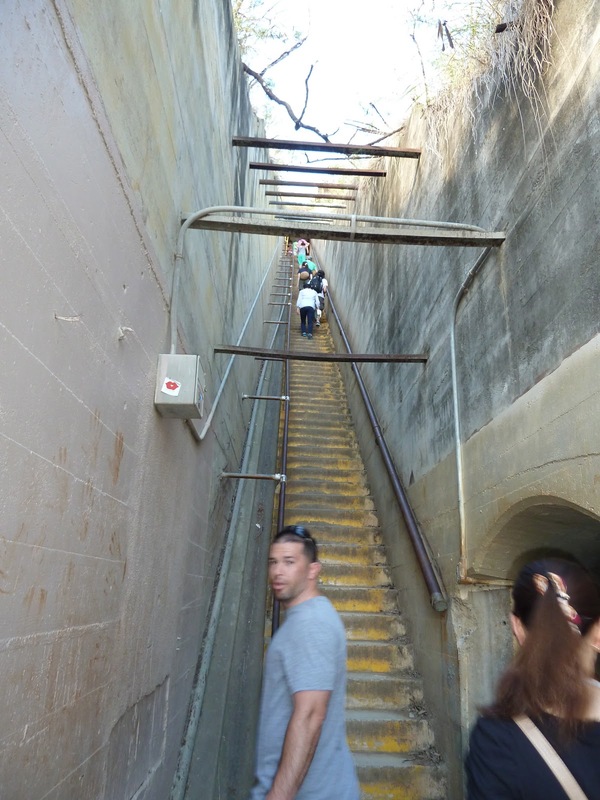 or "If you want to visit Diamond Head, stay in the right lane, our exit is coming up ahead." We were worried about morning traffic heading into Honolulu from Aulani, but there wasn't really any. One area it slowed for just a bit but nothing like we were expecting at around 6am. So we followed Larry and all was well, until Larry wanted to take us the scenic way thru Waikiki Beach. We figured we'd follow him since he's the tour guide. So we get pretty close to the main drag of Waikiki Beach then Larry suddenly tells us to take a left and once we get in the left lane, he tells us that we're headed for the Punchbowl Crater. Um? Thanks Larry, but we don't want to be headed that way. We had been talking and were paying attention to him a little earlier when he told us to stay put if we were headed for Waikiki. We only heard make a left, so we did. Well, that was it. I was panicked. Looking back, I really don't know why, but I was. So I'm panicking and Matt is yelling at Larry. So we get all turned around, because we're now in Waikiki where the roads make absolutely no sense. Finally, we get ourselves back on the H1, like our original plan, and tell Larry to shut it for a while. We end up following Matt's original plan and it worked out. We saw a nice scenic view of the neighborhood and then we were there. We got back to our car and pulled out at exactly 7:50am. So from pulling in to pulling out it took Matt & I exactly an hour. 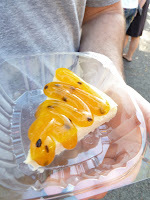 We were headed across the street to the Community College to partake in some farmers market fun, Hawaiian Style. This was awesome. I had read a bunch about it before coming so I was ready to eat. We first, got some Passion Fruit Cheesecake and then Matt got some from parmesan and butter coated corn on the cob while I waited in the tremendous line for the market's famous, Pesto Pizza and then we finished it up with a shrimp roll, a Thai Iced Tea and a pineapple juice. Being from NY, don't ask our honest opinion on it, but for those outside of the NY area, I can see why you would find it amazing. 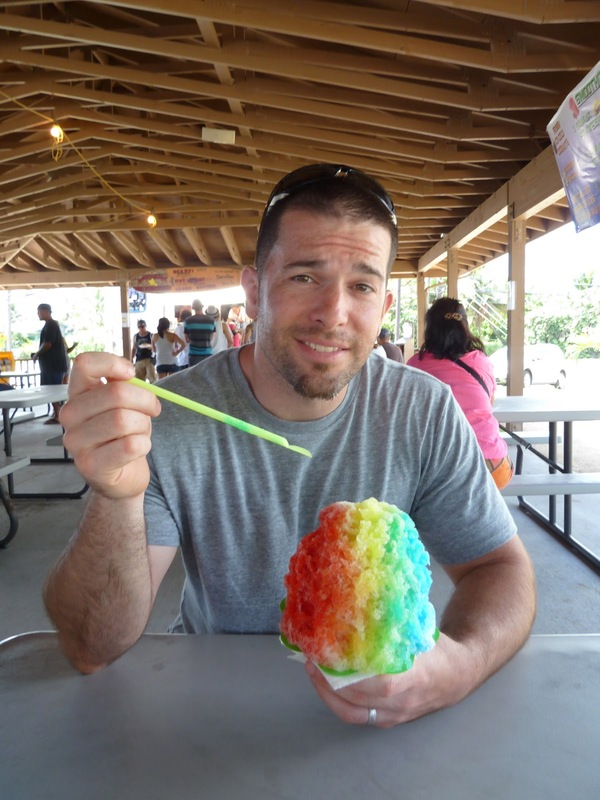 Everything sold at the market is local to the Hawaiian Islands. They have everything. The market is only held on Saturdays from 7-11am. We spent about an hour there and then decided to move on, but not before watching the world's worst driver try to back out of a parking spot. Oh. My. God. Our next stop was the Pali Lookout. Before leaving the KCC Farmers Market we took the top down (of the car!) for the first time this trip. Driving the Pali Highway in the convert able is so worth it! 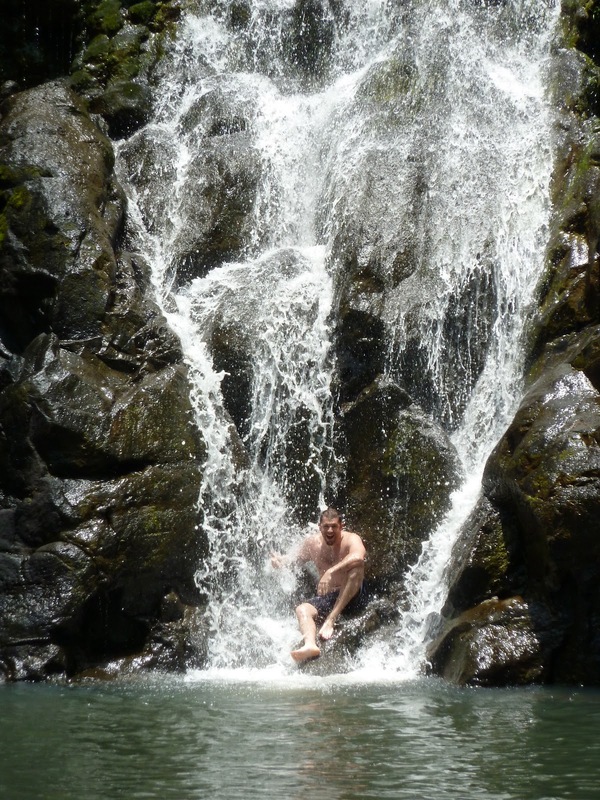 It's beautiful and Matt's first look at the Hawaii he had always imagined. After a visit at the lookout, we headed to the Byodo-In Temple for my "Lost" loving hubby. Apparently, in the tv show someone get married there. I don't know. Once there Matt looks at me and says, "Let's pray.". Uh? We're standing in front of a giant Buda and we are NOT Buddhist, rather, Bible believing, grew up in church our whole lives, Christians. I was so confused. Bad timing. So once out of the Temple we said a quick prayer of our own, just to Jesus instead. After I though my hubby was trying to convert us, we headed up highway 83 also known as the Kamehameha Highway for a nice scenic drive along the ocean up to the North Shore. 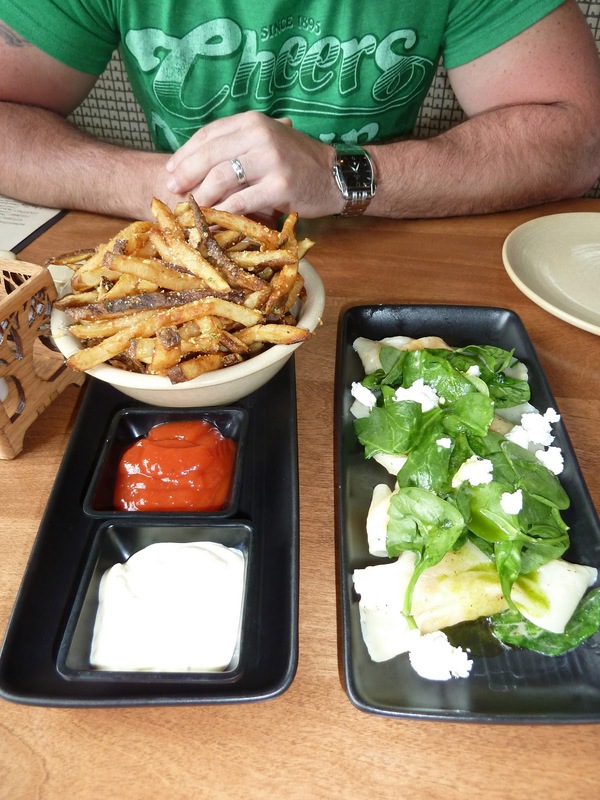 We stopped at Turtle Bay to take a look around and then it was time for some lunch. Giovanni Shrimp truck to be exact. North Shore is famous for the shrimp trucks and now we know why. Even MattyBoy is not a seafood guy loved their scampi shrimp. So good. 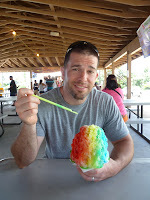 Matt also got a shave ice which was very good. Next is was to Waimea Vally Botanical Garden for a nice hike landing us at our first waterfall of the trip, that Matt swam in. I kept a bench company while playing paparazzi. We tool the $4 shuttle back to the entrance. Highly recombined, especially if you have been up since 2:30am and already hiked Diamond Head. I was feeling it. The hike here is only three quarters of a mile but there is some hills and one giant hill that you'd have to climb up to get back- it's all paved though. We didn't go thru any of the other trails since we were pretty beat. Next we were headed to Laniakea Beach (Turtle Beach) where Matt did an incredible driving maneuver that you had to see to believe. Basically we had parked on one side of the street but realized that we needed to move, so Matt sees a spot exactly opposite us, across the bumper-to-bumper street. Wham-bamb two maneuvers later we are parked exactly opposite where we were causing only a minor traffic jam. It was impressive. People on the street must have thought we were nuts, but we knew what was up. 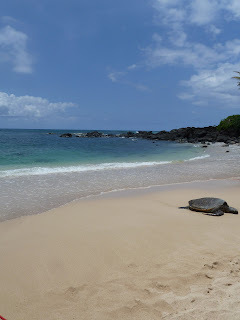 Once on the beach we were lucky enough to get to see a giant turtle sunning himself on the beach. We took some pictures and video and then Matt headed in the water for a bit while I kept some nice shade company. He was only in the water maybe 10 minutes, since this wasn't really a planned swimming day. While he was in the water I saw I local catch an octopus and where it on his head. It was an interesting time. 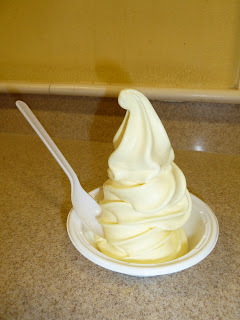 Our final stop of the days was at the Dole Plantation, only really to have a Dole Whip. We got there right around 2pm accompanied by a pretty serious rain storm. We sat in our car for a while waiting for it to pass. We were having fun Facebooking and talking smack. Once, the showers calmed, we made a run for it. We enjoyed some Dole Whip, looked around a bit and then headed home. 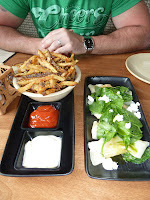 Once back at Aulani, Matt showered and I changed and then we headed for an early dinner at the awesome restaurant across the street, Monkeypod. It was happy hour and they had an AWESOME live band. Happy Hour offered half price appetizers (except any with seafood), $9 pizzas and $4 beers and cocktails. Matt and I ordered the truffle fries and pumpkin ravioli which were both amazing and then Matt got the Margarita pizza and I got the one with pepperoni, kalamata olives, onions & green peppers- a glorified supreme. The pizzas were also very good! Then we split a strawberry creme pie, which they are very famous for an we now know why. Wow! It was like a light cheesecake almost. So good. Once we were finished eating we stopped over next door at our first of many ABC stores (glorified 711) to get a case of water and our first souvenir for who else, my nephew Austin. We were wiped. We got back to our room and while Matt sat on the balcony, I laid in bed fixing the GPS. It fixed itself while I slept. Matt came and joined me and we both were our by 7pm. We are actually enjoying the jet lag since it's helping us with our early morning days. We have one more tomorrow and then tomorrow night we will force ourselves to stay up as late as possible and stay in bed as late as possible. We haven't really been able to enjoy much of the resort at all, because we've been gone or sleeping. We were going go in the hot tub last night, but that didn't happen. Monday we'll really get to enjoy the resort. Well, I'm off to bed. I have an appointment with some sharks in the morning and I've been a nervous wreck since about 4pm this afternoon. I'm not even nervous about the sharks! I'm nervous that I'm going to get seasick & how freaking cold the Hawaiian water is. My Jersey Boy doesn't think the water's that cold, but for this prima donna, it is! *I'm going to start uploading all our pictures to our photo site, probably tomorrow night. The link is at the top of the blog. Enjoy.